Why olive drab tax paid cans? We all know that there are a few tax paid OD brands, including the Fort Pitt crowntainer (both IRTP and WF), the Regal Pale and the Sicks Select OI (both IRTP and WF). There may be a few others pictured in the USBC1 or that have since been found. Regardless, their number is dwarfed by the WF examples. Assuming these were not mistakes, and the can company contrived to create these, then I can come up with any number of rational explanations, but I'll chime in later. We've all read a number of articles on OD cans over the years, but I don't recall any of them addressing this. (maybe?). 1. Is there a consensus among collectors for the reason such cans were produced? 2. Do we know if these were made before or after the war or both? 3. Why are there so few brands, and with the exception of the Fort Pitt, all being west coast? Re: Why olive drab tax paid cans? I always assumed the Sicks' 6 select IRTP was a mistake that was discarded by the can company and then a re-purposed full sheet was found (heating duct? Roofing? ), split up and rolled. I think (but don't know for sure) that all the Sicks' IRTP cans are rolled from that sheet. I have one of the better one's of the Sicks' cans from that find but most are pretty scratched up like they were re-purposed while a sheet. (I think the same scenario happened with a sheet of the Red Sicks' Select WF cans as well). My best guess: These breweries were producing WF olive drab cans during World War II. 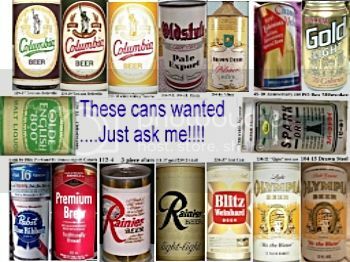 Perhaps after the war ended and when (or before) canning was resumed for domestic use, these breweries had quantities of unused cans available at the can company. Rather than waste the on hand cans, they simply ordered the existing OD cans with the WF statement replaced by the IRTP statement. Much cheaper than designing new cans and much cheaper if the brewery had already contracted for a certain number of OD cans. Just one theory.